From the outside a couple of enlarged boulders on the Baltic Sea – on the inside the audience is listening the sound of whales resting on daybeds. European Museum of the Year 2010 is crossing the boundaries between an aquarium and a natural history museum. Ms. Wittassek explains this organic type of scientific measuring on a tour through the museum. The Ozeaneum explores the life in the Baltic and North Atlantic seas. Its name is a pun containing „Ozean“, the German word for „ocean“, and „museum“. By now, it is structured in four different exhibitions: „World Ocean“ provides an account of the seas‘ diversity of life, whereas „Baltic Sea“ explores a sea that is very special in its flora and fauna and low in its amount of salt. For „1:1 Giants Of The Sea“, the museum’s plastinators have built the biggest sea animals such as a blue whale and a giant squid in their original proportions. They are hanging from the ceiling of the museum’s highest building, and in the darkened space the visitors can lay down on blue daybeds, listen to the songs of the whales and just feel like under water. Besides all that, the „Children’s Sea“ provides for an extra offer to the younger ones, and there are two aquarium walks, too. The first impressions equal the impact that lasts: the Ozeaneum is a world of experience, nonetheless operating by scientific seriousness. Today, Dr Götz-Bodo Reinicke is the Scientific Director of Deutsches Meeresmuseum and curator for the ecology of the seas, coelenterates, molluscs, and echinoderms. Besides all that, he is in charge of the Ozeaneum’s exhibition „The World Ocean – Diversity Of Life“. The biologist also was part of the inaugural meeting in which the basic ideas for the Ozeaneum were targeted at. „It was July, 18 in 1998 when we all met to discuss a new museum for Stralsund“, he remembers with ease. It became clear that what used to be shown at the Deutsches Meeresmuseum would be split into different sections. At the end, this decision led to the organisation of Deutsches Meeresmuseum at large as it is today: It consists of „Deutsches Meeresmuseum Stralsund“ itself, showing the whole range of sea life, yet focusing on tropical sea life in its aquaria. 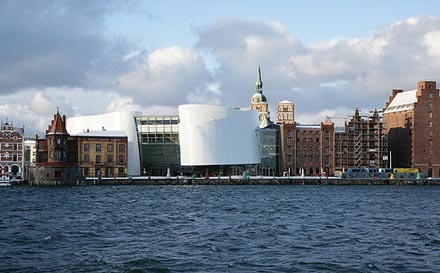 Further parts are the „Ozeaneum“ with its focus on the Baltic and Northern Sea and the „Nautineum“ as an open air museum providing for large scale objects from marine research and fisheries. For example, a submarine station spreads its shiny blue and orange colours wide into Strelasund bay. Furthermore, there is an outside post as a part of Deutsches Meeresmuseum. The „Natureum“ is located at the Leuchtturm Darßer Ort, a historical lighthouse at the edge of the Darß peninsula. About 60 km by car from Stralsund, the Natureum documents the specific flora and fauna of the Bodden landscape with its characteristic lagoons. So the situation that arose more than ten years ago in Stralsund might sound like an architects‘ dream: Building a flagship museum from scratch, right within a characteristic skyline that can be seen from Germany’s biggest island Rügen. Yet, as Dr Reinicke explains, the company that would build the Ozeaneum would have to act more as a service provider than a free-wheeling artist. „Already in the call for participation, we described the three basic exhibitions that we in fact show today. As well as the basic structure: It was as planned by ourselves as it was realised later on.“ Behnisch Architekten, an international office with its core seat in Stuttgart, Germany, got the job. They envisioned an ensemble of oversized stones that are washed around by the Baltic Sea’s waves. It worked out well, besides of the fact that the three different entrances at three different sides of the building were too much for the visitors‘ service to handle, when there are 5000 visitors at peak times, bringing along buggies and wheelchairs. So now in off-season, the museum focuses on one entrance. After the jubilees of the 2010 award for the Ozeaneum, there will be one more reason to celebrate in Stralsund in 2011 as the Deutsches Meeresmuseum at large will commemorate its 60th anniversary. As a part of the festivities, there will be an additional exhibition shown at the Ozeaneum: Amongst others, „Exploration and Utilisation of the Seas“ will show GEO. In a wonderful beatles-like yellow, the GEO was a research submersible and the first German manned tool of its kind. „We try to communicate the several museums of Deutsches Meeresmuseum as a whole entity“, says the museum’s speaker Monique Wittassek. „Yet titles such as the ‚European Museum of the Year Award 2010‘ highlight the Ozeaneum at this moment.“ When next year’s festivities begin, the focus may change once more.